Parents experience endless milestones with their children. Some magical and heartwarming, some awful and unavoidable. Teaching young children about death, family member or pet, tops the terrible list, but there are tools and attitudes moms and dads can arm themselves with, that can ease the conversation for all. Paw Pods is on a mission to make pet loss beautiful, easily understood, environmentally safe and as dignified as possible. Working on any similar stories where this could be a good fit? Please let me send you a sample! This creates infestations in storm drains, ponds and rivers that kill the ecosystem, creates a competitor and predator to local fish and affect the growth of native plants. Not only is it illegal and unfair to your pet, but the goldfish harm the natural environment as they can grow to the size of dinner plates. Paw Pods Fish Pods can help young ones avoid the trauma of seeing a pet flushed down the toilet. This also may serve as an important teaching tool for parents, death can be very difficult to explain, let alone comprehend for children, make them a part of the process. Creativity helps the healing process. You and your little one can decorate the pods with your pet’s name and pictures to allow children to be involved in creating a pet memorial and leave their sadness behind. 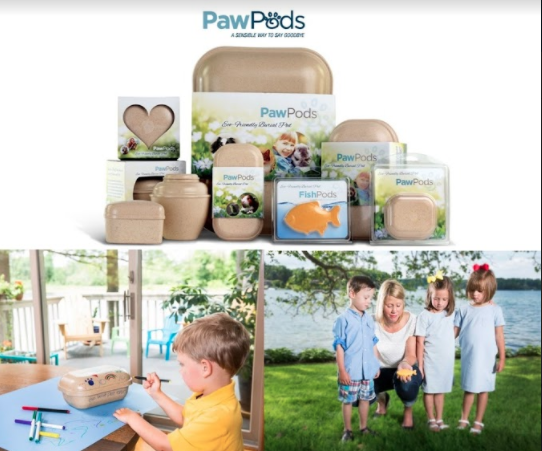 The ultimate teaching tool that shows kids the value of a life, while also comforting them at the time of loss, say goodbye to your pet the healthy, sensible way with Paw Pods.